Our current ad is presented weekly here on our website and in-store. This shows you our competitive pricing on specific Chevrolet models. We even add in other makes every so often such as Ford, Toyota, Hyundai, Honda, Chrysler, Dodge, Jeep, Subaru, Nissan, BMW, Mercedes, etc.! Stay up to date every Friday on this Current Ad page. It is proof that EVERY CHEVY SELLS FOR LESS HERE AT CENTRAL CHEVROLET!!! At Central Chevrolet, our staff understands how important it is to find the right vehicle at the right price. With our vehicle specials, you can do just that. 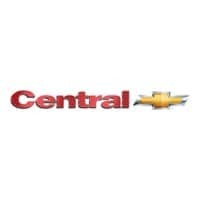 For over 50 years, Central Chevrolet has been committed to customer satisfaction, ensuring that every customer is completely pleased with their experience. Central Chevrolet of West Springfield offers the largest selection of new and used vehicles in the area. Staff makes it easy to find the perfect automobile to suit your needs. Sales managers are transparent about our prices, and with the best deals in the area, you can rest assured that you are getting the most for your money. The finance department is happy to help you find a financing solution that fits your budget. Technicians are ready to handle every one of your service needs, whom are all certified and trained to exceed expectations. So you are in the market for a new vehicle? Each week our team collaborates to put together new car specials; The perfect solution to helping you save money on your automobile. 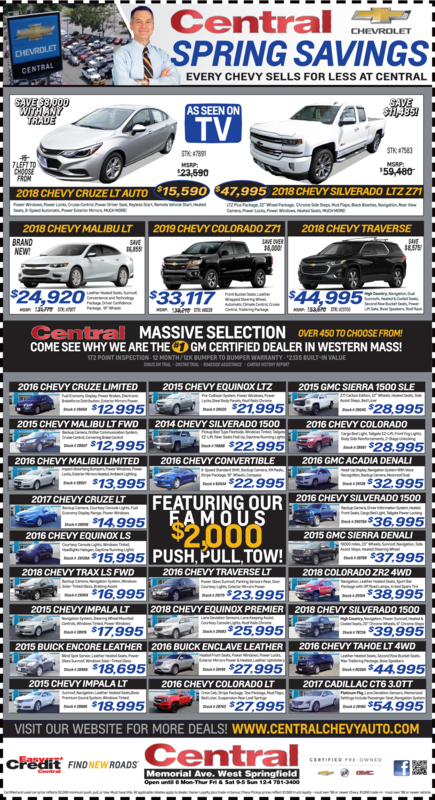 Central Chevrolet offers deals on specific models with financing specials you won’t find anywhere else. Are you searching for zero percent APR for 60 month? Our salesperson will see if you qualify! We offer particular specials on our dealer demonstration vehicles AND deals to help you save money on your auto lease. In the market for a used vehicle? Be sure to check out our used car specials. Deals include reduced prices on vehicles of many different makes and models. A certified used vehicle is a great way to get that extra assurance of quality. Get a bargain on a Certified Pre-owned vehicle with one of our special deals, available on vehicles of all types including trucks, compact cars, and SUVs. For a great bargain on your next vehicle, contact us to find out about our available specials today.